This week, Democratic lawmakers are speaking up about “a colossal political scheme” to mislead the public about climate science. In 1923, the National Lead Company took out an advertisement in National Geographic touting the health benefits of lead paint. “Lead helps guard your health,” the ad claimed. “Lead concealed in the walls and under the floors of many modern buildings helps to give the best sanitation.” At the time, warnings about lead poisoning in workers and children were beginning to circulate in the press, and the industry was scrambling to defend itself. In 1928 companies banded together under the umbrella of the Lead Industries Association, which tried to counter what it saw as “undesirable publicity.” For decades the LIA insisted publicly that fears about lead poisoning were overblown, that it was merely “a slum problem.” Meanwhile, in private, the industry was studying and discussing the very significant health threat posed by its product. Sound familiar? 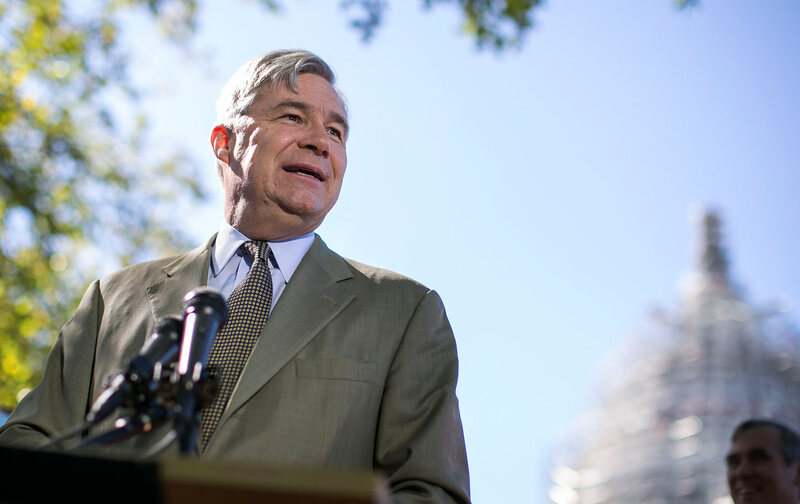 According to Senator Sheldon Whitehouse, who initiated a landmark case against three paint manufacturers and the LIA when he was the attorney general of Rhode Island, the LIA presents “an early example of the strategy of an industry creating a propaganda campaign to try to defeat the actual science about the hazard of their product.” Big Tobacco used a similar strategy to undermine research showing smoking to be unsafe. So did the fossil-fuel industry, Whitehouse believes, with regard to climate change—though instead of promoting climate skepticism through one major trade association, fossil-fuel interests funded a whole network of think tanks and political groups. On Monday and Tuesday, Whitehouse and more than a dozen other Democrats in the Senate gave floor speeches about this “web of denial,” calling out the organizations that together “have developed and executed a massive campaign to deceive the public about climate change to halt climate action and protect their bottom lines.” Democrats in both chambers of Congress also introduced a resolution condemning the efforts of the lead, tobacco, and fossil-fuel industries “to deliberately cast doubt on science in order to protect their financial interests.” The resolution calls on fossil fuel companies to cooperate with investigations into their climate change activities. Whitehouse was one of the first members of Congress to raise the idea of bringing a civil case, similar to the racketeering suit Bill Clinton’s administration brought against the tobacco industry, against fossil-fuel companies for deliberately misleading the public on climate science. I spoke with him on Tuesday about the “web of denial,” as well as claims that criticizing fossil-fuel corporations and outside organizations for their positions on climate amounts to a violation of free speech. (One of the groups mentioned in the floor speeches, the Competitive Enterprise Institute, called the action “a McCarthy-style attempt to shut down the democratic process.”) “That argument is a crock on so many levels that it’s almost hard to summarize all of them,” Whitehouse said; read on for his rebuttal. Zoë Carpenter: You wrote an op-ed in The Washington Post last year, and gave a couple of floor speeches, comparing the fossil-fuel industry to Big Tobacco and raising the prospect of a Department of Justice investigation. That idea has really picked up momentum since then. What do you think has changed in the past year that’s led to so many other people joining in that call? Senator Sheldon Whitehouse: I think the more people look at the similarities between what Big Tobacco did, and what fossil fuel has done, the more the resemblance becomes apparent. I give huge good marks to InsideClimate News and the LA Times, who really put the “Exxon knew and then, chose to lie” argument right before the public. I think that reporting is probably what has given it the most impetus. You can’t read the academic literature on the denial apparatus without having the tobacco comparison pop up over and over again. Even the lawyer who did the tobacco lawsuit for the Department of Justice has made the comparison. Virtually everybody who looks carefully at the fossil-fuel industry’s behavior sees the comparison with tobacco. "It's only when the fossil fuel industry is the subject of attention that you get this very sudden concern about the First Amendment." This particular speaking blitz isn’t just about Exxon and other fossil-fuel corporations, though. Can you explain the format of the floor speeches—why each senator is speaking about particular think tanks or political groups? One of the ways in which the fossil-fuel industry works its mischief is through this big array of front groups that they have set up to hide their own hands, and give a seeming independence to the views that are expressed. Back in the old days of tobacco, the tobacco companies hid behind a group called the American Tobacco Institute. We still have an American Petroleum Institute, so there is still a little bit of that old-school behavior going on. But clearly, the fossil-fuel industry has recognized that you’ve got to hide your hand better than calling it the “American Petroleum Institute.” That’s why they set up this whole cadre of groups: Heartland Institute, George C. Marshall Institute, Jefferson Institute, Madison Institute, all to crank out their propaganda through what seems to be independent sources. Can you talk a bit about Donors Trust, one of the more notorious and heavily-veiled of those groups? Donors Trust has been described as the “dark-money ATM” for the denial apparatus. What you find, once you’ve given your front group a neutral name like the George C. Marshall Institute, is that the media and other people can still follow the money and show that it’s coming from the Koch brothers and ExxonMobil and Peabody Coal. So they have created these two organizations, Donors Trust and Donors Capital, which are paired organizations. Their sole function is to launder the identity off of donors giving to these front groups. It creates one more difficult step for the public, for editorial-page editors, for journalists, for researchers, to figure this out. They’re the identity-laundering machines for the fossil-fuel industry, supporting this array of phony front groups. Exxon says that they’ve stopped funding climate-denial groups. Is that true? They’ve ratcheted back a little bit, I would say. They have abandoned some of the more disgraceful groups, like the Heartland Institute, at least directly. We don’t know for sure what they’re doing through Donors Trust and Donors Capital—if they’ve just rerouted the money and hidden their hand, it’s hard to tell. In the case of Big Tobacco, there was a series of congressional hearings that served an investigative purpose, but also to make pariahs of the CEOs and change public opinion about smoking. Is that part of the goal for this series of speeches? The goal is to bring attention to a colossal political scheme that is designed to operate in the dark and to take the American public unawares. If the denial apparatus is called out as being what it is, which is a big complicated front for the fossil-fuel industry, it will be less effective. In an open democracy, all this behind-the-scenes and under-the-table mischief is stuff that merits being called out. Exxon’s defenders claim that the company’s “free speech” is being violated by the attorney-general investigations; one columnist wrote yesterday that you and your colleagues are similarly “waging an assault on the rights of civic organizations and corporations to speak their mind on matters of public policy.” What separates Exxon or Peabody’s actions from protected speech? That argument is a crock on so many levels that it’s almost hard to summarize all of them. Let me mention three. The first is, the human-shield argument. What we’re saying is, this looks like it is comparable to the tobacco civil lawsuit, which only brought civil charges and brought them only against the tobacco companies, and their major front group, the Tobacco Institute. All of this, “trying to shut down scientists, trying to punish skeptics,” is purely imaginary. It’s trying to put human shields around what the real target is, which is: Did these companies know better and lie? Fraud has a very particular standard. Courts are quite good at distinguishing fraud from differences of opinion. That’s what they do, which takes me to the second point. Fraud has never, ever, ever been considered protected speech under the First Amendment. The statement of law that they’re basing the First Amendment case on is just plain not the law. The third element is that they have never given a red hot damn about the First Amendment when the shoe was on the other foot. When the fossil-fuel industry had Attorney General Cuccinelli cranked up in Virginia to torment Michael Mann, the climate scientist at the University of Virginia, did you hear any complaining? Not a peep. Right now, government subpoenas are being sent and threatened against individual scientists and groups by government committees controlled by the Republicans with an obvious desire to hinder, obstruct, discourage, and impede the work of those who get the subpoenas, and there’s not a peep of anxiety or concern about that. It’s only when the fossil-fuel industry and its web of denial suddenly are the subject of attention that you get this frenetic and very sudden concern about the First Amendment. Do you think subpoenas from Republicans could actually damage the state-attorneys-general investigations into Exxon? Once again, there’s this humongous double-standard, where the fossil-fuel front operatives on the Republican side want to harass and get into the files of the sovereign state attorneys general. If they’re asked for any discovery into their own files, you could only imagine how they’d jump up and down and try to hide behind this speech and debate clause. Looking ahead: In an election year, obviously, there’s lots of other news to compete with. What’s the strategy going forward? The AG investigations, I assume, will take a long time. I think that the public in this election is, on both sides of the aisle, sick of the government that they feel does not respond to local issues because it is too often in tow to huge and powerful special interests. Whether it’s not paying any attention to what’s happening to the moose in New England that are covered with ticks and dying because the snow cover has gone back; whether it’s the ski industry in Utah saying, “We’re losing our season. Something really has to happen”; whether it’s the lumber industry out west with massive deforestation because of the pine beetle foraging northwards as the planet warms, or the expanded fire seasons that they’re seeing all over the West, or the fisheries’ collapses that all of our coastal states are seeing—all of that is getting zero attention from Congress because the fossil-fuel industry won’t let Republicans participate in a lawful conversation about it. I think that plays right into the concern about special interests dominating Washington and ignoring local concerns. I think we have to cast it that way. That’s what we’re trying to do. There is a very big special interest that is exerting disproportionate control in Washington—and trying to hide it, and to sabotage the government in its effort to solve the immediate problems that farmers and fishermen and foresters all face at home.